Winter “blahs” starting to set in? We’ve got a solution for that–let us help add some sunshine to your days! Join us for one, two, or all of our Winter Warm Up events happening in the coming weeks. Looking forward to seeing you there. Be sure to sign up on the RSVP sheets on the Family Ministries board so we can plan accordingly! Please see flyer for details. 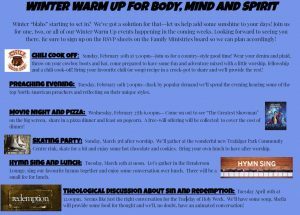 We hope you can sign up for some or all of our Winter Warm Up events.